Signs with encouraging messages were handed out to members of the community at the start of the event. The signs told students to “Be your best” or “We believe in you.” There were several signs in Spanish with similar encouraging messages for students that might still be learning English. Malany said that the event was attended by 126 men in the community. Woodward Elementary School students pass through a tunnel of high-fives and cheers Monday morning during Woodward’s “Hour to Empower.” Principal Ryan Malany said he was inspired to do the event because many students at Woodward are lacking positive male role models. From 7:45 a.m. until 8:45 a.m., walkers, bus riders and students being dropped off walked into Woodward high-fiving, fist bumping and shaking hands with 126 men from throughout the Delaware community, including firefighters, police officers and school administrators. Woodward Principal Ryan Malany organized the event. He said some students at Woodward don’t get to have positive interactions with a male role model, so he invited men in the community to come and encourage students with messages of positivity. Delaware City Manager Tom Homan attended the event to show his support for the school. Likewise, Delaware County Sheriff’s Office Chief Deputy Jon Scowden said he was there Monday to support the community, but he added that he felt a special conviction to attend because he’s a father. Few men at the event had a bigger smile than Antiwan Towns, who was one of the first faces students saw after getting off the buses. Malany said he believed the first “Hour to Empower” was “an outstanding event,” and he was “super impressed” with the turnout. 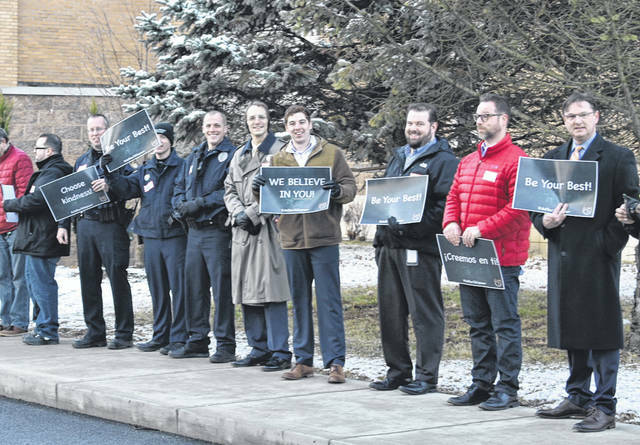 https://www.delgazette.com/wp-content/uploads/sites/40/2019/03/web1_DSC_0987.jpgSigns with encouraging messages were handed out to members of the community at the start of the event. The signs told students to “Be your best” or “We believe in you.” There were several signs in Spanish with similar encouraging messages for students that might still be learning English. Malany said that the event was attended by 126 men in the community. 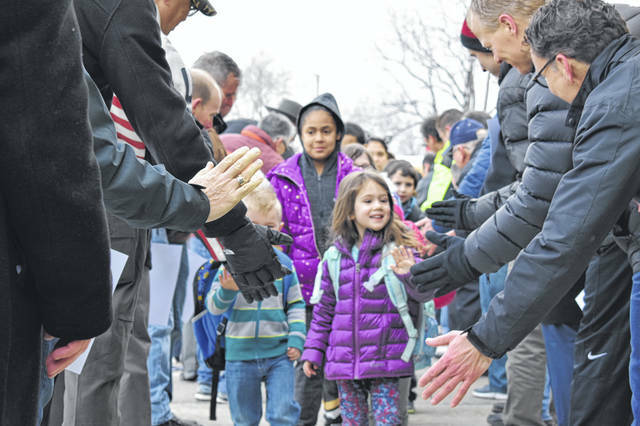 https://www.delgazette.com/wp-content/uploads/sites/40/2019/03/web1_DSC_0060.jpgWoodward Elementary School students pass through a tunnel of high-fives and cheers Monday morning during Woodward’s “Hour to Empower.” Principal Ryan Malany said he was inspired to do the event because many students at Woodward are lacking positive male role models.